Nikon | Imaging Products | Best of the Rest / Nikon Family Cousins, Part 7 : "Nikomat EL"
Home > Products & Support > Imaging Products > History > Camera Chronicle > Part 7 : "Nikomat EL"
Part 7 : "Nikomat EL"
The Nikon AUTO 35 (See Part 4.) released in September of 1964 was the first SLR camera to feature built-in AE mechanism. But since this model was a lens shutter SLR camera, it had some limitations. Next step was to work on developing a focal-plane shutter SLR camera with AE mode. Nippon Kogaku K.K. worked this theme in earlier stage compared with other companies. In fact, it was just after the Nikon Auto 35 was put on sale in 1964, when several engineers started this challenging development. 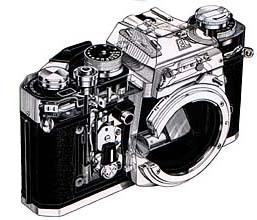 Cameras perform auto-exposure in different ways, but with a focal-plane shutter SLR camera, the question of what to do with the interchangeable lenses determines which auto-exposure method should be used. The system adopted for Nikon Auto 35, which detects the galvanometer's pointer needle with a saw-tooth cam, requires modification of interchangeable lenses, since it controls the aperture value automatically. Thus, a mechanism which controls lens aperture from the camera is necessary for each interchangeable lens. If such a system is something like the EE Control Unit DS-1 for Nikon F2 Photomic S, which was developed later, then the interchangeable lenses do not require modification, since a motor directly turns the aperture ring. However, this is not a clever solution. As a result, the electronic shutter which automatically controls the shutter speed was adopted as the most feasible system. With this system, most functions can be controlled inside the camera body without having to worry about the lens mechanism. All that is required is transference of the lens aperture value to the camera body. Nikon's system was much advantageous since the aperture coupling shoe was already built into most interchangeable lenses. Automatic control of shutter speed according to the subject brightness with electronic shutters was frequently adopted in lens-shutter rangefinder cameras, the so-called compact cameras. But applying such shutter systems into focal plane shutter SLR cameras were big problems. At that time, SLR cameras naturally had to have TTL metering. However, the TTL metering could not be used during the exposure, because the light from the subject is shut out just before the shutter opens and not available until the completion of exposure. But, it is just after the shutter opens when the electronic shutter mechanism starts to use the signal from the light sensor to control exposure time. This leads to the odd situation of being unable to receive the signal at the necessary time. Some of you might think, "Wait a minute here are TTL-AE cameras that detect the meter pointer needle with a saw-tooth cam, like the Konica FTA. Or the EE control unit can be used for auto-exposure shooting with no special modification." The Konica FTA camera's galvanometer pointer needle is fixed by the cam, right before the mirror flips up and the light to the light acceptance cell is shut out. Also, in the EE control unit, electric current to the servo-motor is shut out right before the mirror action, and the metered signal just before the shooting is fixed or memorized. In order to make TTL-AE possible using an electronic shutter, the metered value just before the picture is taken should be memorized in the control system to control the shutter speed. Although the installation of digital circuit into the camera has become commonplace to memorize the data with ease, it was unthinkable back then to put a digital circuit used in a computer into a camera. To memorize analog signal in analog circuit, a capacitor was used, which can maintain its terminal voltage for a while. It worked, but making this system accurate enough was very difficult and it required good amount of further development to achieve it. Various methods were tried for signal processing and shutter speed control of this capacitor memory type circuit. The success of the SLR TTL-AE development relied on the issue of how this memory system and its signal processing was dealt with. I won't get into all the details, but suffice it to say that several manufacturers came up with many designs and patent battles behind the scenes were fierce. This SLR TTL-AE system took a long time to develop, and it was not until 1969 that the first prototype of Nikomat EL was actually made. The electronic version of the Copal Square S shutter unit used for the Nikomat FT had been already developed, which was called the Copal Square SE. This was adopted into the shutter mechanism of this first prototype, which was called "5B", as a member of the Nikomat lineup (Photo: Left). version of the Nikomat FTN (1967) (See Part 6.). The heart of the camera's electronic circuitry was made of several transistors situated in the "control section" under the shutter dial. This is a hub of the camera, in a sense, because a galvanometer to indicate the automatically controlled shutter speed and a pointer to indicate manual set shutter speed were also installed in this section. The 5B prototype was successfull, but a major problem arose just before moving to mass production. This camera's shutter control circuit used a system known as "logarithmic compression/expansion method", which might have impinged upon another company's patent. Countermeasure had to be urgently taken and thus several ideas were considered. The horseshoe-shaped printing chip can be seen on the pentaprism area. A JIS standard hotshoe is on top part of the pentaprism. The finder screen is not interchangeable. A microprism-type screen model and split image prism-type screen model were in production. However, the scale of circuitry had become much bigger and putting the system onto an IC (integrated circuit) became imperative. The company needed an electronics manufacturer to make a custom monolithic IC. But even if 74 transistors and 27 resistances were integrated into a 2mm squared IC, circuit size would never be as compact as it was previously, and would be too large to fit the circuit into the control section. Ultimately, the design of the top cover's pentaprism part was changed, and a horseshoe-shaped ("U" shaped) printed circuit board was located in the space between the top cover and prism (See transparent figure at left). As cameras became more electronic, designers bore the burden of having to figure out how to put all the electronic parts into such a limited space. Now, the thin, paperwork-like flexible printed circuit (FPC) is installed everywhere. But back then, only thick and hard printed circuit board existed, and thus they had to be placed on top of the pentaprism area, like something drying place on top of a roof of a Japanese house. Another problem : where to store the battery ? An electronic shutter camera requires higher voltage and electric current, so a big battery (a 6.2V 4G13 silver battery presently known as 4SR44 silver-oxide battery) had to be used. At that time, location of battery compartment was a major problem for each company's electronic shutter SLR cameras, and the Nikomat EL was no exception. Holding this camera for the first time, it is almost impossible for the user to find the battery box cover at once. It is just a puzzle ! open the battery box cover at the bottom of the inside of the mirror box in order to change battery. of the camera and the battery was to be removable from the outside. But a shutter-charging rack running from right to left along the bottom of the camera necessitated the more awkward placement of the battery box. However, Nikomat EL was not the first camera to have the batteries located where they were. Another camera with this distinction included the Contarex S from the German company, Zeiss Ikon. It took time, but the release of the Nikomat EL ("EL" signifying an integration of "Electronics" and "Light", the two) at the end of 1972 led to a huge success. This represented an important technological milestone in the electronic camera industry for various reasons. normally extends up to 4 seconds. However, the shutter dial at the top of the top cover has a wide space between "B" and "4", and setting the dial between the two numbers sets shutter speed at 8 seconds ! Specifications back then allowed for up to an 8-second shutter speeds, but it was discovered at the final stage of development that there was only weak assurance that shutter speed was accurate at 8 seconds under certain circumstances, due to characteristics of the controlling capacitor. Thus, the "8" position was removed from the dial. However, the control resistor remained, making such a long exposure of uncertain accuracy possible.